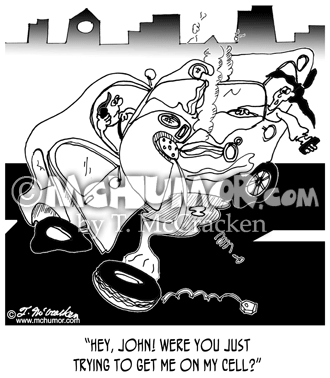 Accident Cartoon 6708: A woman saying to her husband, "Your puppy had an accident on the rug." 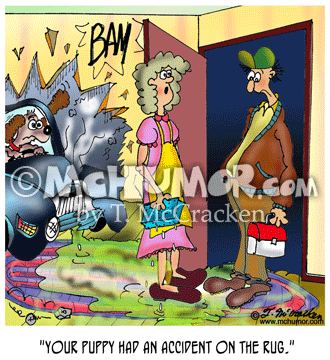 A dog in a car has driven through a wall and is leaking radiator fluid on a carpet. 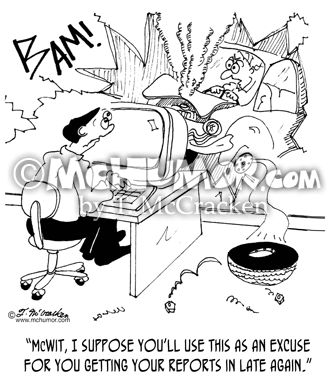 Business Cartoon 7200: A supervisor crashing through a man's wall in his car saying, "McWit, I suppose you'll use this as an excuse for you getting your reports in late again. 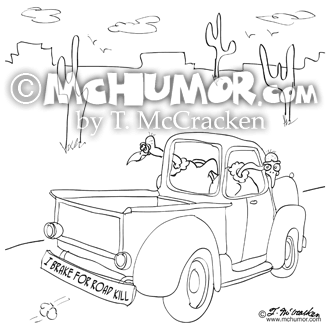 Vulture Cartoon 9281: A vulture drives a pickup truck with a bumper sticker that says, "I Brake for Roadkill." 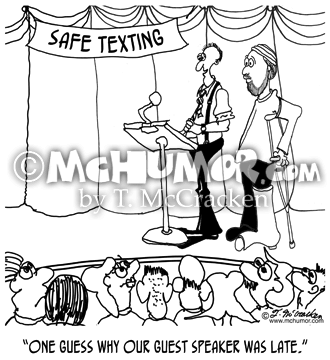 Cell Phone Cartoon 8038: A kid driving while talking on cell phone who has crashed into another kid driving who's talking on a cell and says, "Hey, John! 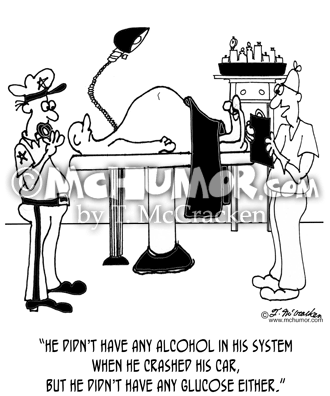 Were you just trying to get me on my cell?" 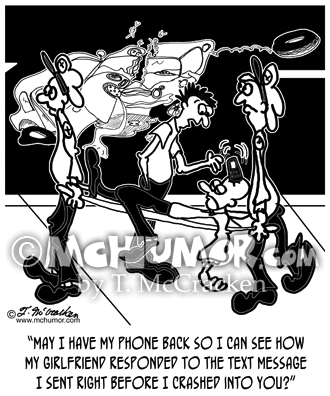 Paramedic Cartoon 8359: As a paramedic pulls an injured person out of a car who has a cell phone embedded in his head, the other driver asks, "May I have my phone back so I can see how my girlfriend responded to the text message I sent right before I crashed into you?" 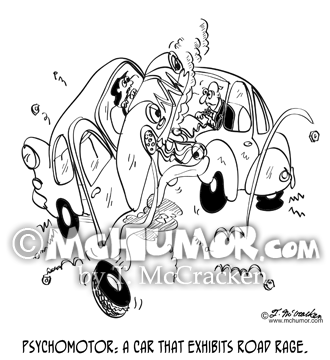 Driving Cartoon 8885: Psychomotor: A car that exhibits road rage. 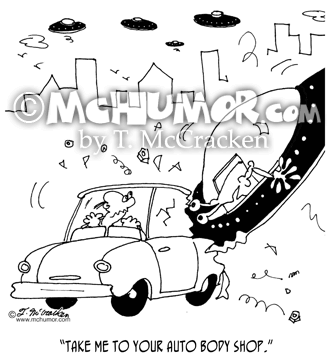 Car Repair Cartoon 7186: A space alien in a flying saucer that's crashed into a car says to the startled driver, "Take me to your auto body shop." 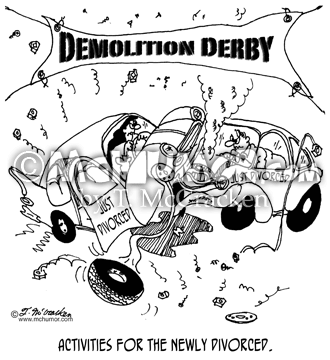 Divorce Cartoon 6860: “Activities for the newly divorced.” Cars ram each other at a Demolition Derby. 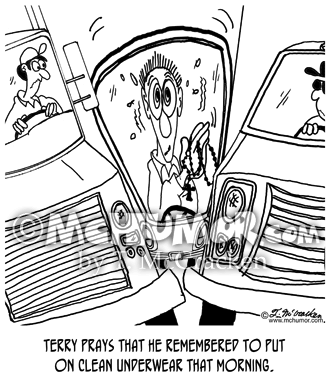 Driving Cartoon 8389: "Fred prays that he remembered to put on clean underwear that morning." 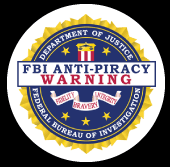 A man in a compact car with rosary beads is about to be squished between two trucks.